The adult emperor moth is a truly spectacular insect. On the wing in April and May, the male of this large, day-flying moth species is a particularly striking sight, and can easily be mistaken for a butterfly due to its bright colours. It is a fairly widespread species, one that favours open scrub habitat on heath land, moorland, fens, along field margins and hedgerows, woodland rides and sand dunes. This is a large moth, with females reaching a wingspan of 35-41 mm (1.22-1.61 inches). Male’s, which are slightly smaller, reach 27-32 mm (1.06-1.26 inches). What the males lacks in stature, though, they more than make up for in the colourful splendour of their markings. On the upper fore-wings the pattern consists of grey, dark brown and orange or pinkish markings, with prominent black and yellow eye spots, reminiscent of the eyes of an owl. The upper hind-wings carry similar eye-spots, these set against an orange background. The female moth also has prominent eye-spots on the wings, but lacks the male’s more colourful markings. Instead the eye-spots are set against a background of buff, grey and white patterns. The thorax in both sexes is covered in long hairs. For the few months that they are on the wing adult emperor moths do not feed at all. Their sole purpose is to find a mate and reproduce. While butterflies locate their mates by sight, moths on the other hand – even day-flying species like the emperor – use smell to locate their partners. 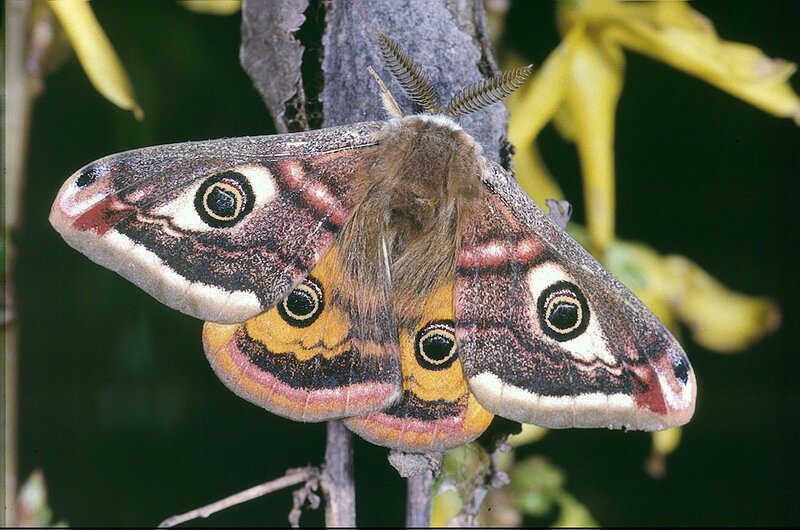 The newly emerged female moths release a unique chemical signature – a pheromone – that is irresistible to male emperor moths. All they have to do is wait for potential suitors to follow the scent trail and come to them. Males, in contrast, fly around rapidly, zigzagging across the breeze trying to pick up the slightest hint of the female pheromone. They can detect it at up to a kilometre away, and just a few molecules collected in their feather-like antennae are enough to set them on a course towards their prospective mate. Males have to hurry, however, as competition for females is fierce, and the first male to arrive has by far the best chance of mating. Once mated, the female takes to the wing and starts laying her eggs in batches on any of the various food plants that emperor caterpillars eat. These including familiar plants like meadow sweet, heather, hawthorn, bramble and birch. The newly hatched caterpillars are black and hairy, and tend to mass together for mutual protection at first. As they grow they gradually spread out and eventually disperse completely. 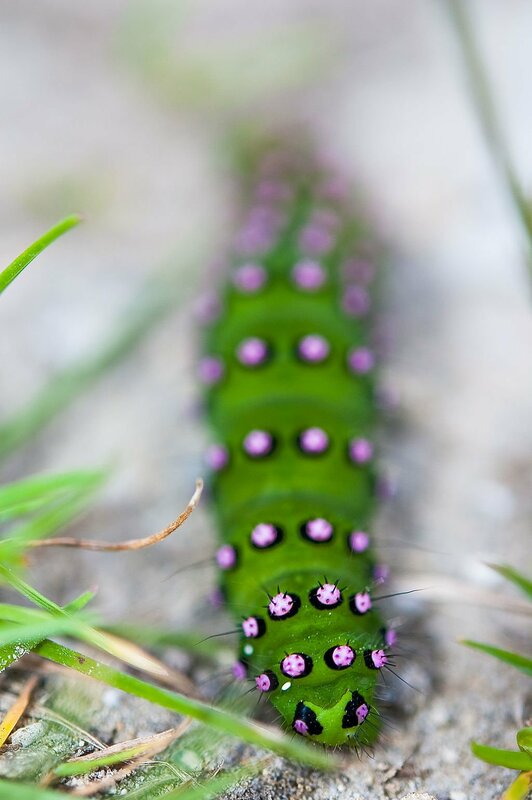 By the time they are fully grown the caterpillars will have turned bright green with black bands, and have yellow, pink or orange bumps on them. Each of these bumps sports a tuft of short black hairs. Once they are large enough the caterpillars that survive spin themselves a silk cocoon, in which they pupate. The cocoon has an interesting one-way exit system: a ring of stiff outward-sloping bristles that makes it easy for the emerging moth to push its way out, while at the same time preventing unwanted intruders from entering. Inside this protective silk casing the pupa spends the winter. The following spring, it’s metamorphosis complete, it emerges as an adult moth to begin the whole process all over again.